Travelling with a toddler isn't easy, I'll be honest, sometimes you get a fluke, hit the home run and they sleep throughout most of your journey, but most of the time they don't and that means being on top of your game to keep them on their best behaviour. Before I had children I used to think that the holiday began when we reached the airport, my Dad is still a firm believer in this phrase and always heads straight to the bar no matter the time. When you've got smalls tagging along, it's really not the same and in my eyes our holiday doesn't begin until we are at our destination and our bags are unpacked - oh how times change. We've been lucky to fly away every year at least once since our boys arrived, along that way we've learnt some invaluable lessons and sharing is caring after all. If you're a seasoned flyer yourself, you'll know what works for you and your family and not everyone is the same, so tailor these how you wish to make them suit for you. Patrick and Noah (my two boys if you're new here) are polar opposites and whilst I could confidently rely on a two year old Noah to sit well and behave, I wouldn't be hedging any bets on Patrick doing that at the same age. A pretty obvious thing you may think, but you have to think about EVERYTHING when you're travelling with toddlers. When we first ever flew with a ten month old Noah, we had a rucksack, quickly realising as we were rummaging around in a bag, blocking the aisle, trying to find a bottle, that we had made a fatal error. Rucksacks are not your friends on flights, but that are great for freeing up extra hands in an airport, so you weigh that one up with what's more important. For us on flights and actually throughout the whole travelling process, Trunkis have been are go to. They open right up so you can instantly see everything you have in your bag, then I like to store things in separate see through pouches, so things don't get mixed up inside. Think snacks in one bag, toys in another, nappies etc. Prams aren't just useful for the conventional purposes of transporting your child, they're literally a trolley to load full of luggage. We found it useful for Noah when he was little, if he wanted to get out of the pram and wander, we were able to free up some hands by popping our hand luggage onto the actual pram itself. Even coats and jackets, anything to give you more hands. Don't forget though, that all of these things will have to come off when you board, and when you're passing through security. Be prepared for that in advance, nobody likes to wait behind the disorganised family at the security gates (that's been us too many times). Don't forget when you board and your pram is taken from you, ask where to collect it, everyone is different and some will leave it at the plane's stairs as you disembark, and others will pop it on the conveyor belt - the last thing you want is a missing buggy and a tired baby. Cabin pressure definitely does something to nappies, without a doubt. I remember Patricks feeling so full after a mere hour of being in it, so make sure you time your changes well. If you're flying short haul like we did to Spain, the queues for the toilet can seem to be long throughout the whole flight. I always change a nappy as soon as the seat belt signs come off after take off, and about 20/30 minutes before we land. I would advise pull ups for flights, as if the complete worse happens and you can't take your baby to the toilet, a pull up is 100% easier to change on your lap than a nappy is. Because guess who's also been there too? Yes me. I don't care how judged you may be, a flight is the ideal time for an ipad or tablet. Think ahead though and make sure whatever movies / tv shows you want, you've downloaded them to be watched without wifi, as somehow I don't think they'll work 30,000ft up otherwise. We also found toy choices to be key, if your little one is into drawing, take an etch-a-sketch or something with a pen attached as opposed to pens and pencils, they'll only fall on the floor and you'll be forever rummaging around peoples feet to find them, especially when your toddler figures out that this is a good game. Noisy toys aren't going to be popular either, we really enjoyed little toys that kept our boys busy and quiet, we had a 'buckle buster' when Noah was two and it kept him quiet for a good thirty minutes as he tried to figure it all out. A top tip would be to keep all these flight toys hidden away, and only present them whilst you're on the flight, that way the novelty is sure to buy you some precious time. Snacks are the way to children's hearts are they not? I stole an idea from the lovely Emily Norris last year for Noah, I grabbed a large pill box from Amazon, and filled each day with snacks ranging from; cheerios to chocolate buttons or raisins, he absolutely adored it. We also packed a few fail safe options, that are mess free and generally take a while to eat, our favourites were; mini cheddars, chocolate chip brioche, and yoghurt covered raisins. Rice cakes are a great one for those under 2 too. As for drinks, we brought our boys own cups with them, empty of course (don't forget fluid restrictions in UK airports) and then bought water in the airport to fill them up. It meant I knew I had a cup with us that wouldn't leak and it was something I knew they could drink from with ease so I wasn't tricked into buying fruit shoots and plying them with sugary rubbish. A great tip for those smaller flyers, is to let them drink on take off and landing to avoid their ears popping, for older children a lolly pop works wonders.. Think ahead about when you land. Though you might take off from London at 7pm in October, you might be landing at 10am in Mexico, so if you're little one is dressed for departure weather, a change of clothes might be appropriate. 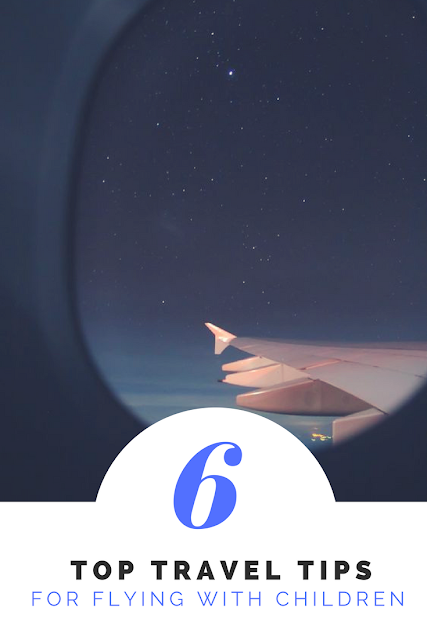 I've always found foreign airports a bit slack in the air conditioning department, and along with that charge to passport control when you land, it can be a sticky business. Last time we flew with the boys it would be night time as we landed, so we made sure to switch them into their pjs so they could sleep on our transfer to the villa, a quick move into bed and we were set for the night. And that's it for my top tips when travelling with little ones, it really is complete pot luck on whether it goes to plan or not. We're yet to experience any complete meltdowns on board, though I'm sure with two little boys on our hands that is definitely to come. We haven't set our travel plans for this year in stone, but I've definitely been looking, whether we'll be heading to my parents villa again or somewhere completely different, Holiday Gems has a range of Majorca deals that I have been eyeing up this week. Even a little break away for me and John when the kids holiday with my parents could be on the cards. Have you got anything in the diary for holidays this year? Some good travel tips here! Also, I love the Koala top!! You've got some fantastic tips here. I didn't know that about nappies being really full - will definitely bear that in mind. I'm dreading flying with Reuben now he's a toddler if we end up doing it any time soon. He has full on tantrums these days if he can't run about he would hate being stuck in a plane seat! Great advice! We have never flown with all four of ours, I think we will now they are a little older! These are really useful tips. As a single, childless person I just try to be nice to people with kids, smile and remember that sometimes children cry on flights and there's no point me getting arsey about it. I have yet to take the little lady on a plane, it’s something that I am dreading tho. You have listed so really helpful tips here tho.